I’m not a big fan of lip balms, but I am a sucker for 1) great packaging and 2) celebrity endorsements. 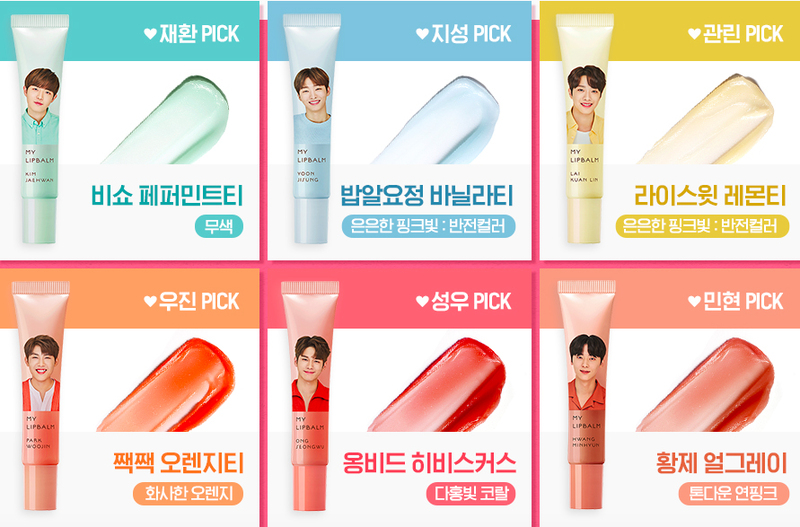 I saw that Wanna One was promoting some Innisfree lip balms with their faces on the tubes and I really wanted to get them; unfortunately, I couldn’t seem to find anyone selling them online at a decent price, so I opted to buy the normal lip balms without the special packaging instead. I couldn’t find a full list of the ingredients online, but what they do have are the key ingredients: sunflower oil, cupuacu butter, and jojoba oil. I found it really hard to pick a shade, so I went with the easiest method: pick the shade of my favourite member 😂 I went with Mint Earl Grey (#06), which looked like a nice shade of apricot in the marketing photos. Packaging: I actually quite like the packaging of this lip balm – reminds me of a tube of paint haha, much like my TFS Finger Cotton Tint. What’s also unique is that the applicator is slanted so that it fits your lips better when you are applying it. Of course, the packaging would be even better if there was Wanna One on it HAHA. Colour: The colour of the product came out a lot more orange than I had initially expected, but it’s not very obvious upon application. It applies like a shiny apricot layer on the skin, which actually looks very nice on lips because it enhances your original lip colour without looking too much like a completely different layer of colour. I have to say though, the colour payoff isn’t as strong as I had expected it to be. 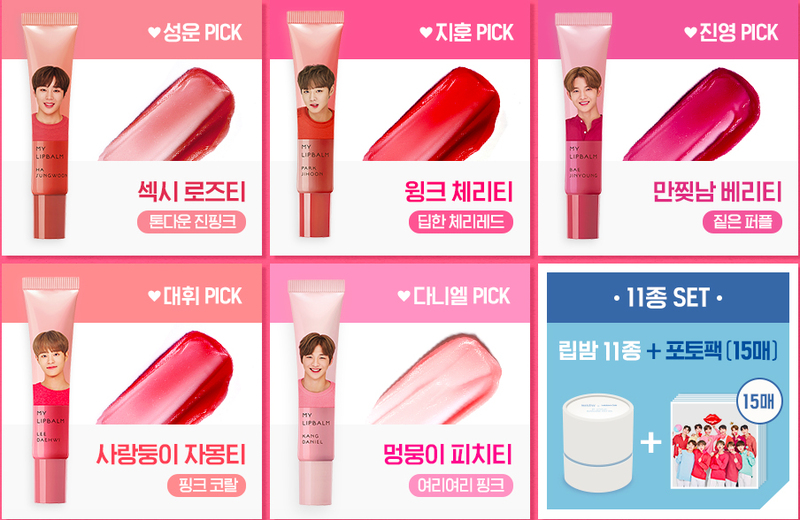 The payoff of Innisfree Glow Tint Lip Balm is quite good, so much so that it looks more like lip gloss than lip balm, while this lip balm is much less pigmented. The staying power of the colour is also rather limited, so I would advise against hoping this will last through an oily meal, or the whole day. Texture: It leaves a nice, moisturizing gloss on your lips without leaving you feeling like your lips can be glued together by the stickiness. Effectiveness: I think that having so many moisturizing ingredients in the product really does help, because my lips did feel more supple and less flakey even after staying in a dry, air-conditioned place for long hours. I have yet to test this in super dry conditions (aka Korea’s winter), so I’ll update this again once I’ve done so. Frankly, I can’t find anything much about this lip balm to dislike, other than the colour intensity and staying power. I do think it is slightly pricey though – I got mine for cheaper from a Shopee seller who even threw in a Wanna One photocard for free. That Wanna One photo card was a cute and thoughtful touch (especially since you got the ‘basic’ packaging). Vivian I love love love these colors, especially #9. Beautiful! Vivian….thank you for stopping by Chapel of Hope Stories and joining the family…it made my day. Happy New Year and the lip balms are so unique…neat idea! I love this article, the lips balms look so beautiful and I love to have a balm like this with just a hint of color for those no makeup days. I am like you though, I do tend to like a product that doesn’t need a lot of reapplying during the day but for this gorgeous balms I think I would put that aside. I like the shade for #5, this is a great brand. I use their sheet masks all the time.